10-12-2010 LET'S CALL IT A PRODUCTION & PROMOTION WEEK! 18-11-2010 PRESS PIC, PRODUCTION STEPS & PREPARATION! 22-01-2011 SO PROUD: OUR STUDIO IS FINISHED!!!!! 28-02-2011 DO YOU REALLY NEED A CROWD TO HAVE A PARTY?!? 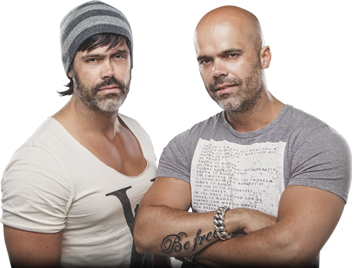 09-03-2011 ROGER SANCHEZ, STEVE ANGELLO & OUR PRODUCTIONS! 18-10-2011 OUR ADE: QUALITY ABOVE QUANTITY! 17-11-2011 LOVERDOSE, WEB APP & FIRST 2012 GIG! 27-10-2011 THERE IS NO STOPPING US RIGHT NOW: ANOTHER VIDEO! 26-10-2011 A NICE FASHIONWEEKEND COMING UP: DRESS UP! 23-10-2011 YOU LIKED, WHAT WE LIKED IN OVERDOSE! 16-10-2011 BECAUSE 'THE SHOECLUB' IS MADE FOR DANCING! 14-10-2011 PRESENTING 'LOVERDOSE': THE FULL TRACK! 11-10-2011 PRESENTING 'LOVERDOSE': THE TRAILER! 09-10-2011 PRESENTING 'LOVERDOSE': THE COVER! 06-10-2011 BECAUSE 'IMAGE BUILDING' IS EVERYTHING! 08-01-2012 'TIGERRIDE' WILL BE UNLEASHED SOON FROM THE BOX! 16-08-2012 HERE IS OUR NEW TRACK: WE GOT THE BODY! 07-10-2012 MAN!AC: THE FULL TRACK & COMPLETE VIDEO IS ONLINE! 09-10-2012 THIS WEEKEND: BITB ALL NIGHT LONG @ MAX BROTHERS! 26-10-2012 HOUSE IS A FEELING: LISTEN TO OUR FRESH MIX! 31-12-2012 END THE YEAR WITH A BANG AND OUR BANGING YEARMIX! 14-02-2013 JUST DANCE ON THIS LOVELY VALENTINES DAY!